Is it just me or are families with twins and multiples everywhere? As it turns out, the rate of multiple births has been rising in recent years. In 2017, there were 128,310 infants born in twin deliveries in the U.S., roughly 3.3% of all pregnancies. So it’s no surprise that the baby industry is catching up to this demographic trend and creating some awesome (much needed) twin products to meet the unique needs of parents of multiples (PoMs). If you have or are expecting multiples, check out some of the best, new-ish products for multiples and their caregivers. These are the items that will help make parenting your twins, trips, quads (OMG!) easier, more manageable and — yes — even fun! Romp & Roost is an oversized playpen with a unique divider for two infants or toddlers to safely sleep without the worry of accidental smothering — perfect for twins. The divider, which is made of breathable mesh, is removable to let your little ones interact in one large space. The Romp & Roost playpen isn’t just great for traveling; it’s also a great solution for your twins to sleep in your bedroom, near your bed, for the first six months (as recommended by the AAP). When you have twins, you may be tempted to buy two of everything. But why do that if you can buy just one! Enter Tiny Love’s oversized play mat. This multi-sensory play mat is much larger than most, making it the perfect play mat for multiples. The arch connector is adjustable and opens to create a larger open space to fit multiple babes. With six different activities and detachable developmental toys, this machine-washable play mat entertains your kiddos and helps them learn and grow. Parents can even record messages to their babies, which helps infants learn language and feel soothed. We love ❤️. One of our favorite tandem carriers, the Twingaroo, just got better. A new conversion kit allows the carrier to be separated into two individual carriers. Great carrier + added versatility = winner! Though not completely new on the scene, I set out to learn more about this viral double Beebo picture (see below). It is not advertised specifically for tandem bottle feeding, but it can certainly be done (you’ll need two!). The Beebo is a hands-free bottle holder that gives you the extra hand(s) you so desperately need as a PoM. It also makes a great shower gift! I love Milestone cards — perfect for snapping Insta-worthy pics! I was super excited to learn they now have a set specifically for twins. The twin card set includes twin-specific milestones, such as: smiling at each other, coming home from the hospital, etc. ; and each age milestone is plural for multiples, like “We turned 1 month today.” Love. When you’re pregnant with multiples, there’s more to worry about. You’re considered a “high-risk” pregnancy simply because you are carrying more than one baby; and you have to think about (and anticipate) issues such as preterm labor, early contractions, and monitoring multiple babies’ movements. Enter: the Bloomlife Smart Pregnancy Tracker. Just stick the Smart Tracker on your belly (easy to follow instructions in the kit) and let it do all the work of tracking and monitoring contractions, helping you differentiate real ones from Braxton Hicks. Bloomlife provides “an accurate second opinion for peace of mind when it matters most.” We love that this tracker is actually for rent. No need to worry about buying an expensive device to use only for a short period of time. Read a fellow twin mom’s experience here. The NuRoo Pocket is a skin-to-skin infant carrier shirt. While seated, it’s approved for twins (even preemies), which is perfect for kangaroo care in the NICU and the first few grueling weeks at home. Tested on babes up to 45 lbs, the shirt comes with a support belt to ensure a secure hold on your littles. 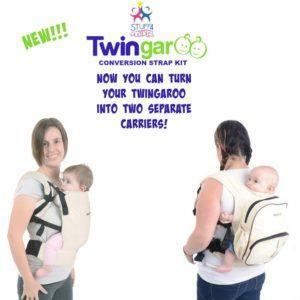 This carrier is perfect to pack in your hospital bag for skin-to-skin for both mom and dad. This glider and bassinet combo has a magnetic docking system that affixes the bassinets to either side of the glider (additional $479 for the second bassinet). The bassinet(s) rocks along with the glider, making the transition from feeding to sleeping seamless for middle of the night feedings, especially when you have two! This is definitely a pricier option, but if you can afford it, it’s ingenious sleep gear that’s worth the investment. Many of us know all about (and swear by) the Halo Sleeper, but it simply isn’t big enough for two. Well, my fellow twin mamas — it’s time to rejoice! Halo recently came out with this double version made especially for twins! It includes a breathable mesh divider so babies can have their own space, yet still enjoy the same sense of togetherness as they did in the womb. The sleeper swivels a full 360 degrees, so you can easily bring the twin who is fussing closer to you for feedings and soothing. This feature is awesome for c-section mamas — easy access to both babies means no getting out of bed in the middle of the night or bending down low to pick up a baby. The sidewalls are retractable, too. They lower and raise so you can easily pull your babies out and put them back in again, and you can also lock them in the upright position. You can also raise or lower the entire sleeper. The swivel sleeper comes with a built-in nightlight (awesome for nighttime diaper changes), three lullaby options, three nature and womb sounds and two levels of vibration. Though some people are saying that the music and vibrations are too weak to actually soothe baby. All in all, the Twin Bassinest is an awesome and convenient way to keep both babies by your bedside. It’s super easy to click the attachment piece (to make it either a triple or quad) in place. Simply attach it onto the belly bar of the Zoe XL2 Best v2 Double (see below), and voila! You now have a ride for three or four kids. Awesome! This stroller is SO cool and versatile, and best yet, it’s easy to maneuver and isn’t bulky. That’s saying a lot for a triple or quad stroller! If you want a full-on review from an actual triplet mama, check out this YouTube video from Catie Graham. She shows you exactly how to use this attachment, and gives you all the deets on the stroller and the attachment pieces. See also: Full Zoe Best XL3 Review. At 30 lbs and only 20 inches wide (suuuuper narrow! ), the Peg Perego Book for Two is a luxury side-by-side double stroller that can be used from birth as a double travel system (using two Peg Perego Primo Viaggo 4/35 infant car seats only, FYI). Like the Maxi-Cosi Dana for 2, this is one of the few side-by-side strollers that is DOUBLE car seat compatible for infant twins. In addition to being narrow enough to fit through standard doorways, each seat offers independent recline, and the canopies operate independently as well (read: no fighting over whether to lay back or sit up, and if one twin wants sun and the other prefers shade, no problem!). Our twin mamas who own this stroller say that it’s easy to fold, maneuver and push; and it rides well over many different types of terrain. So if your twins are little and you have or are planning to purchase Peg Perego car seats, the Book for Two is a solid choice for your travel system, and your regular full-sized double stroller later on. That’s all I got, folks. What are YOUR new favorite must-have for multiples? Share in the comments below!